If there is one thing I have learned about babies in my first two months as a father is that they change --- fast! Since I am out of the house at work for about 10 hours every day, the changes in my now two-month-old son, Vinny, appear to be taking place at a supernatural rate. Even my wife, who spends all day every day with him, can't believe how fast he is changing. Right now, the categories of change are in "physical size" and "level of interaction and alertness." 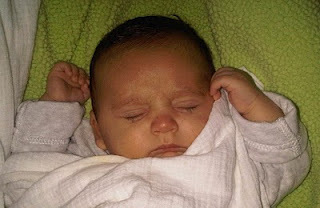 As for physical size, the little tyke came home from the hospital on January 17 weighing 5 lbs. 9 ounces. He has nearly doubled his weight in less than two months. Yep - he weighs about 11 pounds now. I will hold him for a few minutes in the morning before I leave for work, and then when I get home 10 hours later and lift him, I nearly dislocate my rotator cuff due to the "surprise" extra pound the kid put on during the day. What is my wife feeding him? As for his level of interaction and alertness, he is making similar leaps and bounds. It seems overnight he went from staring blankly into space (or the nearest light bulb) to intense, sustained eye contact that would make a wolf blush. And when he is not sleeping or eating, he wants to be entertained. If you are not in his face (a la Earl Weaver arguing with an umpire) talking and singing and making weird noises, he will cry (or scream) to get your attention. He now smiles, and makes cooing sounds and other new faces that only a few days ago would have been the result of gas. Now they are "real." The pressure is on - I have to force myself to be entertaining whenever the little guy needs it! Well, before I know it, I will be coming home to him playing cards in the basement with his buddies.